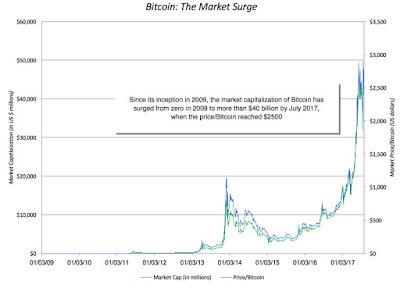 Musings on Markets: The Crypto Currency Debate: Future of Money or Speculative Hype? When it comes to any finance-related questions, I am fair game, and those questions usually span the spectrum, from what I think about Warren Buffett (or why I don't agree with everything he says) to whether tech stocks are in a bubble (a perennial question for worry warts). In the last few months, though, I have noticed that I have been getting more and more questions about crypto currencies, especially Bitcoin and Ether, and whether the price surges we have seen in these currencies are merited. While I have an old post on bitcoin, I have generally held back from talking about crypto currencies in this blog or in my other teaching for two reasons. First, I find that any conversation about bitcoin quickly devolves into an argument rather than a discussion, since both proponents and critics tend to hold strong views on its use (or uselessness). Second, I find that some of the technical underpinnings of bitcoin, ether and other cryptocurrencies are beyond my limited understanding of block chains and technology and I risk saying something incredibly ill informed. While both reasons still persist, I am going to throw caution to the winds and put down my thoughts about the rise, the mechanics and the future, at least as I see it, of crypto currencies in this post. The list of crypto currencies gets added to, by the day, with a complete list available here, with the market caps of each (in US dollars) listed. At least from a market perspective, there is no doubting the fact that crypto currencies have arrived, and enriched a lot of people along the way. Decentralized verification: The validation and verification of a transaction is sourced to members, called miners in the crypto currency world. Verification usually involves trying different algorithms (hashes) to find the unique one that matches the transaction block, and the successful miner is rewarded, currently with the crypto currency. At least, as I understand it, this process requires more brute force (powerful processors trying different algorithms before you find a match) than intellectual firepower. Complete and open records: Every transaction, once validated and verified, is converted into a block of data that is recorded in the block chain ledger, which is accessible to everyone in the network. If you are worried about privacy, the transaction records do not include personal data but take the form of encrypted data (hashes). Incorruptible: A block chain, once recorded and shared, cannot be changed since those changes are visible to everyone in the network and are quickly tagged as fraudulent. Thus, the ledger, once created, becomes almost incorruptible. In effect, a block chain is a digital intermediation process where transactions are checked by members of the network, and recorded, and once that is done, cannot be altered fraudulently. As you can see from its description, the block chain technology is about far more than crypto currencies. It can be used to record transactions in any asset, from securities in financial markets to physical assets like houses, and do so in a way that replaces the existing intermediaries with decentralized models. It should come as no surprise that banks and stock exchanges, which make the bulk of their money from intermediation, not only see block chains as a threat to their existence but have been early investors in the technology, hoping to co-opt it to their own needs. Unit of account: A key role for a currency is to operate as a unit of account, allowing you to value not just assets and liabilities, but also goods and services. To be effective as a unit of account, a currency has to be fungible (one unit of the currency is identical to any other unit), divisible and countable. Medium of exchange: Currencies exist to make transactions possible, and this is best accomplished if the currency in question is easily accessible and transportable, and is accepted by buyers and sellers as legal tender. The latter will occur only if people trust that the currency will maintain its value and if transactions costs are low. Store of value: To the extent that you hold some or all of your wealth in a currency, you want to feel secure about leaving it in that currency, knowing that it will not lose its buying power while stored. Given these requirements, you can see why there are no perfect currencies and why every currency has to measured on a continuum from good to bad. Broadly speaking, currencies can take one of three forms, a physical asset (gold, silver, diamonds, shells), a fiat currency (usually taking the form of paper and coins, backed by a government) and crypto currencies. Gold's long tenure as a currency can be attributed to its strength as a store of value, arising from its natural scarcity and durability, though it falls short of fiat currencies, in terms of convenience and acceptance, both as a unit of account and as medium of exchanges. Fiat currencies are backed by sovereign governments and consequently can vary in quality as currencies, depending upon the trust that we have in the issuing governments. Without trust, fiat currency is just paper, and there are some fiat currencies where that paper can become close to worthless. For crypto currencies, the question then becomes how well they deliver on each of the purposes. As units of account, there is no reason to doubt that they can function, since they are fungible, divisible and countable. The weakest link in crypto currencies has been their failure to make deeper inroads as mediums of exchange or as stores of value. Using Bitcoin, to illustrate, it is disappointing that so few retailers still accept it as payment for goods and services. Even the much hyped successes, such as Overstock and Microsoft accepting Bitcoin is illusory, since they do so on limited items, and only with an intermediary who converts the bitcoin into US dollars for them. I certainly would not embark on a long or short trip away from home today, with just bitcoins in my pocket, nor would I be willing to convert all of my liquid savings into bitcoin or any other crypto currency. Would you? Inertia: Fiat currencies have a had a long run, and it is not surprising that for many people, currency is physical and takes the form of government issued paper and coins. While people may use credit cards and Apple Pay, their thinking is still framed by the past, and it may take a while, especially for older consumers and retailers, to accept a digital currency. That said, the speed with which consumers have adapted to ride sharing services and taken to social media suggests that inertia cannot be the dominant reason holding back the acceptance of crypto currencies. Price volatility: Crypto currencies have seen and continue to see wild swings in prices, not a bad characteristic in a traded asset but definitely not a good one in a currency. A retailer or service provider who prices his or her goods and services in bitcoin will constantly have to reset the price and consumers have little certitude of how much the bitcoin in their wallers will buy a few hours from now. Competing crypto currencies: The crypto currency game is still young and the competing players each claim to have found the "magic bullet" for eventual acceptance. As technologies and tastes evolve, you will see a thinning of the herd, where buyers and sellers will pick winners, perhaps from the current list or maybe something new. It is possible that until this happens, transactors will hold up, for fear of backing the wrong horse in the race. Ultimately, though, I lay some of the blame on the creators of the crypto currencies, for their failure, at least so far, on the transactions front. As I look at the design and listen to the debate about the future of crypto currencies, it seems to me that the focus on marketing crypto currencies has not been on transactors, but on traders in the currency, and it remains an unpleasant reality that what makes crypto currencies so attractive to traders (the wild swings in price, the unpredictability, the excitement) make them unacceptable to transactors. Markets are forward looking: If you are a believer in crypto currencies, the most optimistic explanation is that markets are forward looking and that the rise in the prices of Bitcoin and Ether reflects market expectations that they will succeed as currencies, if not right away, in the near future. 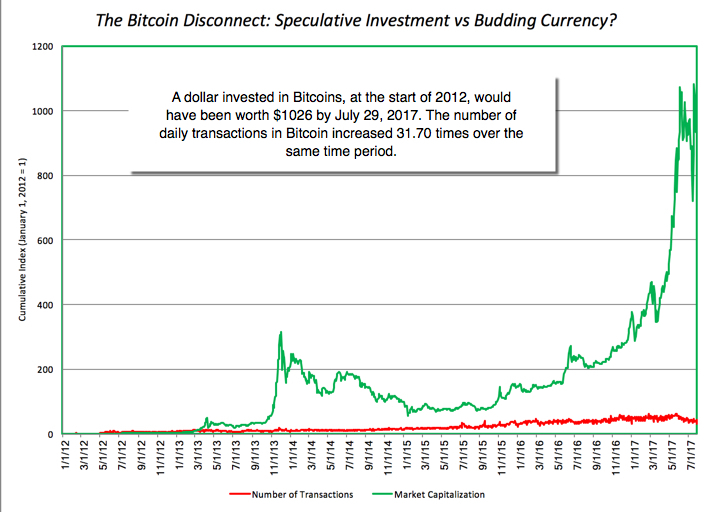 Speculative asset: I am second to none in having faith in markets, but there is a simpler and perhaps better explanation for the frenzied price movements in crypto currencies. I have long drawn a distinction between the value game (where you try to attach a value to an asset based upon fundamentals) and the pricing game, where mood and momentum drive the process. I would argue, based upon my limited observations of the crypto currency markets, that these are pure pricing games, where fundamentals have been long since forgotten. If you don't believe me, visit one of the forums where traders in these markets converse and take note of how little talk there is about fundamentals and how much there is about trading indicators. Loss of trust in centralized authorities (governments & central banks): There can be no denying that the creators of Bitcoin and Ether were trying to draw as much inspiration for their design from gold, as they were from fiat currencies. Thus, you have miners in crypto currency markets who do their own version of prospecting when validating transactions and are rewarded with the currency in question. For ages, gold has held a special place in the currency continuum, often being the asset of last resort for people who have lost faith in fiat currencies, either because they don't trust the governments backing them or because of debasement (high inflation). While gold will continue to play this role, I believe that for some people (especially younger and more technologically inclined), bitcoin and ether are playing the same role. As surveys continue to show depleting trust in centralized authorities (governments and central banks), you may see more money flow into crypto currencies. Transaction, not trading, talk: From creators and proponents of the currency, you will hear less talk about how much money you would make by buying and selling the currency and more on its efficacy in transactions. Transaction, not trading, features: The design of the crypto currency will focus on creating features that make it attractive as a currency (for transactions), not as investments. Thus, if you are going to impose a cap (either rigid like Bitcoin or more flexible, as with other currencies), you need to explain to transactors, not traders, why the cap makes sense. Trust in something: I know that we live in an age where trust is a scarce resource and I argued that that the growth in crypto currencies can be attributed, at least partly, to this loss of trust. That said, to be effective as a currency, you do need to be able to trust in something and perhaps accept compromises on privacy and centralized authority (at least on some dimensions of the currency). It is also worth noting that the real tests for crypto currencies will occur when they reach their caps (fixed or flexible). After all, bitcoin and ether miners have been willing to put in the effort to validate transactions because they are rewarded with issues of the currency, feasible now because there is slack in the currency (the current number is below the cap). As the cap becomes a binding constraint, the rewards from miners have to come from transactions costs and serious thought has to go into currency design to keep these costs low. Hand waving and claiming that technological advances will allow this happen are not enough. I know that there are many in the crypto currency world who recognize this challenge, but for the moment, their voices are being drowned out by traders in the currency and that is not a good sign. 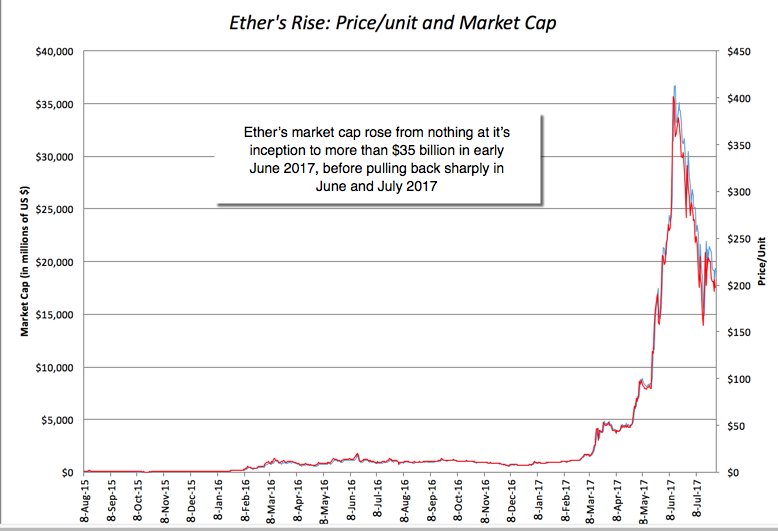 If you expected a valuation of bitcoin or ether in this post, you are probably disappointed by it, but here is a simple metric that you could use to determine whether the prices for crypto currencies are "fair". Currencies are priced relative to each other (exchange rates) and there is no reason why the rules that apply to fiat currencies cannot be extended to crypto currencies. A fair exchange rate between two fiat currencies will be on that equalizes their purchasing power, an old, imperfect and powerful theorem. 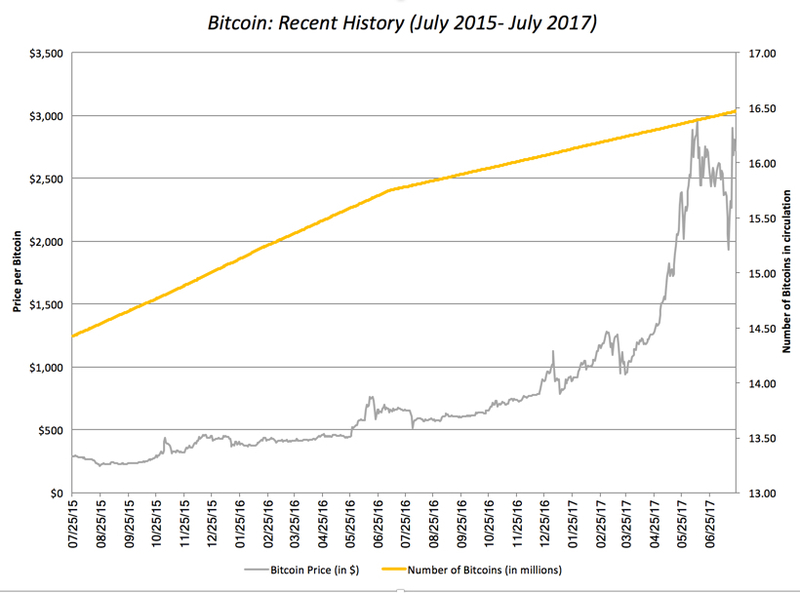 Consequently, the question that you would need to address, if you are paying $2,775 for a bitcoin on August 1, 2017, is whether you can (or even will be able to) but $2,775 worth of goods and services with that bitcoin. 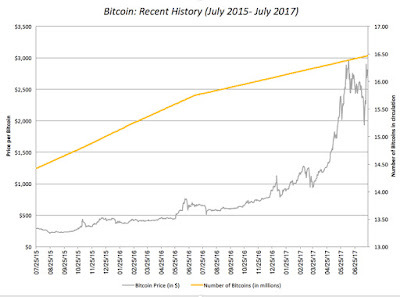 If you believe that bitcoin will eventually get wide acceptance as a digital currency, you may be able to justify that price, especially because there is a hard cap on bitcoin, but if you don't believe that bitcoin will ever acquire wide acceptance in transactions, it is time that you were honest with yourself and recognized that is just a lucrative, but dangerous, pricing game with no good ending. Crypto currencies, with bitcoin and ether leading the pack, have succeeded in financial markets by attracting investors, and in the public discourse by garnering attention, but they have not succeeded (yet) as currencies. I believe that there will be one or more digital currencies competing with fiat currencies for transactions, sooner rather than later, but I am hard pressed to find a winner on the current list, right now, but that could change if the proponents and designers of one of the currencies starts thinking less about it as a speculative asset and more as a transaction medium, and acting accordingly. If that does not happen, we will have to wait for a fresh entrant and the most enduring part of this phase in markets may be the block chain and not the currencies themselves. Great post simplifying what bitcoin is and does, Professor. Just a simple question: Say I'm a car dealer, and think if I was to accept 10 bitcoins for a particular car, would the value of those 10 bitcoins change with the change in price on the exchange? They may be worth ~25000 dollars today, but if there's no certainty as to what it's worth tomorrow, why in the world would this be a legitimate currency? Very informative and concise explanation of cryptocurrencies. As far as I can tell, the main beneficiaries of cryptocurrency transactions are those who are trying to avoid the law. Maybe that is not a bad thing if you live overseas in a tyrannical dictatorship, but here in America, why would I want to get my money intertwined in a snake pit of people trying to avoid the law (including those trying to avoid taxes). That doesn't sound very safe at all. I'll stick to my US dollars, thanks. Jay, I believe he addresses that in the price volatility paragraph. Short answer is, you are correct. The "value" of the bit coins would change and that is a factor to why it is not a legitimate currency today. I think there is another issue holding back the acceptance of Bitcoin (and other cryptos) as a currency: Essentially nobody has BTC-denominated liabilities. For any fiat currency, essentially everybody has fiat-denominated liabilities -- when their tax bill comes due, if nothing else. Without BTC liabilities, there's no strong driver of mass crypto-currency adoption in the near-term. 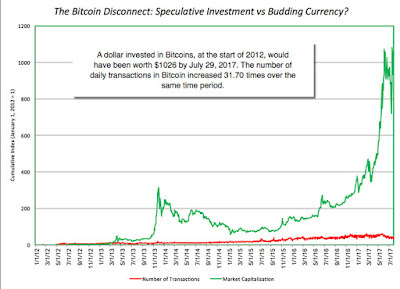 I think that until we see a strong crypto credit market develop (even if that credit is just "I owe my landlord 1 BTC at the end of the month"), crypto currencies will remain a speculative instrument rather than a currency. 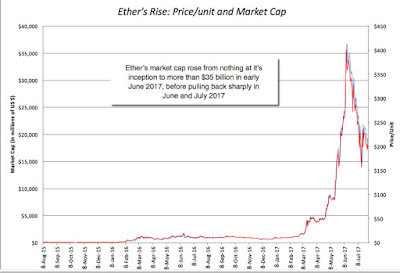 This can also be read as a more bullish case for ETH as a currency, in that a small number of people do have ETH-denominated liabilities, since it costs ETH to run smart contracts on the ETH blockchain. Jay brings up a great point. I think a fourth axis of success will be the HV(250) or 1 year volatility of the currency pair with fiat currencies (say BTC/USD or BTC/EUR) should be under 8%. > Transaction, not trading, talk: From creators and proponents of the currency, you will hear less talk about how much money you would make by buying and selling the currency and more on its efficacy in transactions. > Transaction, not trading, features: The design of the crypto currency will focus on creating features that make it attractive as a currency (for transactions), not as investments. Your argument applies to every currency then. How are you sure that those 25,000 USD will have the exact same purchasing power tomorrow? BTC is just extremely volatile compared to others and that may be the reason you don't want to sell your car for it. Maybe you can read about Vitalik Buterin, proof of stake and Raiden to make an informed call. Cryptocurrencies--sadly--may be THE ultimate solution to the money launderers. The goal of money launderers is to clean up their illegal wealth so that they can freely enjoy the monetary benefits. So in most cases of money laundering, they don't mind losing a portion of it (sometimes even a sizable portion of it). It's better to own a usable dollar than a dirty 100 dollars. Money laundering is a huge global issue but not many people actually paying much attention to the anti movements. In fact, many financial institutions/professionals are still doing their best to facilitate money laundering, for obvious reason. Criminals have been hiring the best minds to creatively turn their dirty money into usable dollars; while on the other hand, the FATF has been fighting hard to counter money laundering, by even hiring ex-criminals (a theft) to "catch the thieves". Therefore, if cryptocurrencies are to be more accepted by various merchants in the future, it's heaven to the illegal money -- untraceable, no interference by government and secured. According to UNODC, approx $800b to $2t are being laundered globally PER YEAR. Bitcoin and Ether are now valued at $67b. There is a huge market for them. Again, money launderers don't care about volatility, they want validity and usability. That's why I hate the invention of crytocurrencies, it incentivizes illegal and immoral activities. Professor a nice piece. However I believe that one of the conditions for any currency to function as one is to have a store value. The same is mentioned in your blog. The volatility in the value of bitcoins would really prevent it from being a currency. Hi Professor! This is Michael Hasson from the class of 2014. I think one thing many people miss is that cryptocurrency systems based on smart contracts like ethereum enable decentralized software networks which essentially monetarily incentivize open source development. Have a look at networks like golem and siacoin for clear examples. They blend the "cryptocurrency" world with "shared economy" and introduce the power of the crowd to create a decentralized version of essentially cloud computing resources. What happens with these networks is that they are open sourced, so the development is accelerated thanks to legions of developers and users pushing forward, while all parties are incentivized to see the success of the project assuming they hold the tokens. The tokenization essentially enables a new economic system, a hyper focused economy so to speak (the theory of competitive advantage on steroids). Nicely done piece (I'm always on the lookout for good explanations of bitcoin presented in Plain English!!!). But I take issue with one of your primary assumptions. You're well aware that bitcoin is a blockchain-based system. In fact, you describe it as a "digital intermediation process" that poses a threat to stock exchanges and other financial mechanisms. But you then evaluate it strictly as a currency, for which you (understandably) find it a bit wanting. However, a novel currency wouldn't threaten NYSE...only a novel system would. Bitcoin is not a currency, in my view. It is a currency + system thingamajig, a cryptocreature that is unlike anything economists or programmers or money managers have seen before. Standing it alongside gold or fiat currencies or other conventional entities -- and evaluating it based on conventional notions of currency -- might be missing the point. I don't know if Bitcoin will thrive or not, but if it does, it may very well succeed precisely because of its strange hybrid nature and its refusal to be pigeonholed as conventional currency. Main motivator for indivually owning crypto positions is the will to disrupt centrally appropriated power obtained through undemocratically formed monetary systems that its governors aren't prepared to democratically change. Crypto units as they exist now enable just redistribution of that power through independent mathematical decentralization with central authority playing a maximally diminished role in the process. It is all about reinforcing the people and moving away from easily created abusive central governing, regulating and corporate bodies. Even if you get rid of proof-of-work, one still has the huge overhead from the decentralization--having to copy transactions across thousands of computers. Even without that overhead, the fact that 30% of the economy--the government sectors---use fiat currencies puts any cryptocurrency at a huge disadvantage because adopters will have the expense and risks of conversion between fiat and cryptocurrencies to pay taxes. The only time cryptocurrency could have an edge is in an economic collapse where a government's currency becomes completely unstable; however, by that time most people don't have anything of value to exchange for the cryptocurrency. Furthermore, a better store of value would be investment in productive and useful assets. I have researched and read quite a bit about Blockchain. I work in the financial sector (valuation and predictive modeling) and whenever I discuss blockchain and ask "why not just create a database" I cannot get a clear answer. For example the claim is blockchain makes it easier to audit by having everything available on the decentralized blockchain rather than scattered in multiple databases. This seems a bit odd, because 1) doing so would replicate documents and information multiple times, 2) because of the inefficiency involved in such replication, the blockchain often only just stores a hash of the document to allow verification & hence you still have to go to some database to look at the data, and 3) if you want to limit access to the document on the blockchain you would have it encrypted and still need to go to multiple sources to get the encryption keys. The real problem seems to be consistent easy to use protocols for the secure exchange of data and management of digital signatures. One just needs agreement on protocols and adaptation of systems to work with them--difficult whether you use blockchain or not. BTW---I have worked with many problems with errors and bad data, including a major financial restatement. None of the problems involved people altering data or contracts after entry into a document system or database; they all involved mistakes in entering the data or human judgments on interpretations of rules or appropriateness of valuation methods. None were addressable via blockchain. Blockchain seems to succeed just as a marketing technique; if you can claim your solution uses blockchain you get to the front of the line. The key reason, I think, is that the blockchain is distributed and ownerless and, in essence, creates itself. In principle, a database could manage the same sort of information processes as the blockchain. But a database would be designed and owned by a central organization, requiring across-the-board "trust" in the organization and its principles. Visa or Paypal manage databases that do a lot of what the blockchain can do. If you're fine with Visa and Paypal (and fiat currencies) then the database idea is workable and no alternative is needed. But if -- as another commenter noted -- Bitcoin is motivated by the desire to "disrupt centrally appropriated power..." then the central database just won't do. Hi Professor Damodaran, great post. I'm surprised that no one in the comments has mentioned IOTA. I believe it doesn't use blockchain but instead a process called Tangle. Plus it eliminates "miners" by requiring the user to process 2 transactions before his 1 transaction is processed. It was created with the IoT sector in mind and would see machines using the tokens to transact among themselves. Might want to check out their white paper. Great blog post. Cool to see my hobby being covered by the mainstream financial blogosphere. 1. Your point of bitcoin being about low-trust is spot on. If I had to summarize it in one sentence I would choose that it's a currency that tries to minimize the requirement for trust, and it does this via open source, cryptography and decentralization. 3. The number of transactions can't be measured exactly. Your graph only shows transactions on the blockchain but bitcoin can have off-chain transactions too. A major is example is bitcoin debit cards, where the user sends a single blockchain transaction to the card which is denominated in bitcoin, and they can use it to spend money anywhere where the VISA network is. This is typically used by people who have an income in bitcoin (which would be one blockchain transaction per month). In the future there will be an update to bitcoin called Lightning Network which greatly improves the cost, privacy and speed of transactions by making them off-chain. 4. Bitcoin's community has been in a mini civil war for the last two years over scalability, which is fundamentally about the properties of transactions. So it is a big issue in the space. 5. There are places in bitcoin where traders don't hang out where fundamentals and software are more likely to be the topic of talk. For example see the #bitcoin IRC channel on freenode. There is, perhaps, a glimmer of hope for cryptocurrencies to be used in the transactions. LAToken is in the pre-sale stage right now and it is marketed as an exchange, where portions of assets can be tokenised and sold there, thereby making both liquid and illiquid assets (such as art and real estate) tradable through unique LA tokens (e.g. "Property1" in NY will be traded as LATokenNY1, for example, and so forth). Bitcoin is being used for international payments, outplacing the Dollar in that respect. Send 5.000 to India, and it arrives at destiny in 15 seconds, validated in 15 minutes. Not to worry with volatitlity, less than 3 days of dollar. Look at the transactions for 10 minutes, every minute one million dollars passes through, forget Miscrosoft micropayments. BItcoin is inflation proof, for the first time in history we have true scarcity, better than gold. And with the US government owing 250 trillion, tresuries are not a safe haven. BItcoin is the reserve of value per excelance. It rises with inflation and world gdp growth. Say 4% year , just by sitting there. 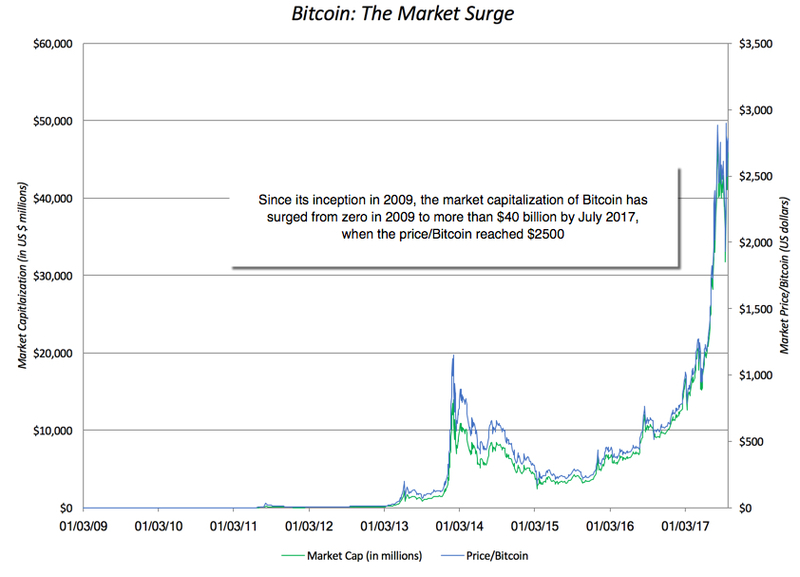 BItcoin is NOT rising in value. One Bitcoin is worth only One bitcoin. Thanks for this interesting information, I've been reading and watching many videos about Crypto currencies and all I could find was topics about trading with it, I just was trying to guess if Bitcoin would help society (and get rid of banks) or was just a speculation product. I'm not good in economy (maybe it should be cause I don't share the principles of capitalist economy). My aim in economy is easy, invest my money in real economy that is producing thus a real service/product. I don't share that companies are to earn money, but to give service to society and as a consequence they can earn money. My investment are in renewable energy, ethical banking and I try as much as I can to work with cooperatives where we are the company and the customer at the same time. So what could be done to convert bitcoin in a more ethical coin and not in a an asset? Avoid BTC accumulation: BTC users will have to pay for the total amount of their wallets a percentage or there's a limits of Bitcoin you can have in your wallet, or there's a expiry date of your BTCs. Where are these BTC going? One part to miners, other will go to some "public" wallets that could be from a Goverment, ngo, association, approved for each state, community, etc, that is they will pay taxes. The user could choose who to pay. In this way we don't solve the problem of illegal/immoral businesses, but at least they'll pay taxes. Maybe it sounds very unrealistic, I know, and I don't know if technically it is possible, but if it is you're converting BTCs in what their purpose is, to be an exchange system that contributes to the benefit of the society.